How to Move a Car in Tight Spaces with Jack Dollies? Home / How-tos Guide / How to Move a Car in Tight Spaces with Jack Dollies? What are hydraulic jack dollies and why do you need them? The Capri Tools hydraulic jack dollies let you lift your vehicle off the ground and move it around to another desired location. 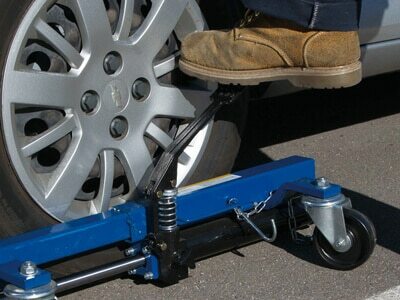 Smoothly lift your vehicle off the ground with ease using a foot operated pedal. Four jacks are used for each vehicle. Each jack is capable of handling 1,500 pounds. Dollies easily roll in all directions using 4 inch swivel casters. How to figure out which jack dolly to buy? 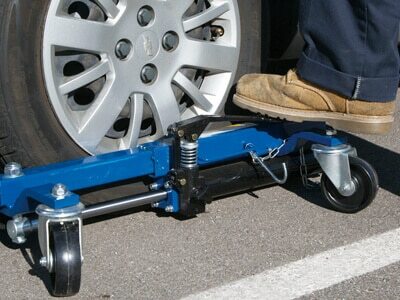 The size of the hydraulic jack dolly is dependent on your vehicle’s tire width. Our 9-inch hydraulic jack dolly fits tires up to 9 inches in width. Our 12-inch hydraulic jack dolly fits tires up to 12 inches in width. Locate your tire width in millimeters on your tire’s sidewall. Divide the tire width by 25.4 to convert the width from millimeters to inches. Use that number to determine which size dolly to purchase. to release pressure from the hydraulic system. 2. 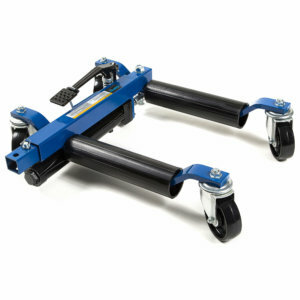 Position the dolly on your vehicle’s tire – with the hydraulic screw open, spread the rollers apart, roll the jack dolly in place with each of the rollers positioned at the tire tread, ahead and behind the wheel. CAUTION: Do not let the wheel dolly come in contact with the sidewall of the tire. 3. Secure dolly around tires, tighten the hydraulic screw, and depress the foot pump. 4. 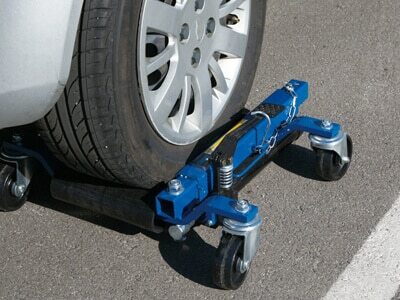 Raise the vehicle – Depress the foot pedal repeatedly until the rollers make contact with the tire. 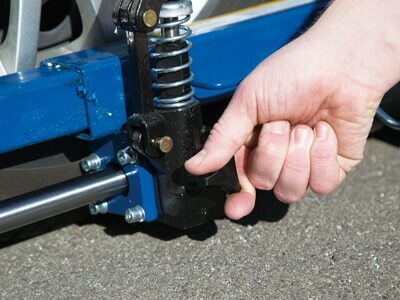 Ensure that the jack dolly is still not in contact with the tire sidewall. Continue depressing the pedal until the tire tread is lifted from the floor. 5. Secure the jack dolly – Place the safety lock pin in the nearest open retaining hole and engage the foot pedal lock to lock the jack in the raised position. 6. Repeat the process with the remaining tires and your vehicle will be ready to be moved to the desired location. If you plan on storing your vehicle for an extended period of time it is important to release pressure from the hydraulic system to avoid damage to the jack dolly. Ensure that the safety lock pin is engaged into the nearest open retaining hole. Loosen the hydraulic screw to relieve pressure from the cylinder. The weight of the vehicle will now rest on the pin instead of the hydraulics. To lower the vehicle after it’s been placed in storage, be sure to first re-pressurize each jack dolly: tighten the hydraulic screw, pump the pedal until each jack moves past the safety pin, and then follow the instructions below to lower your vehicle. Depress the foot pedal slightly to release the foot pedal lock. Remove the lock pin. (The foot pedal may need to be pumped slightly to release pressure on the lock pin). Slowly turn the release valve knob in a counter-clockwise direction ( when viewed from above) to open. Vehicle weight will spread the rollers apart and allow vehicle to lower until the tire tread contacts the floor. Pull jack dolly away from the wheel. Replace foot pedal lock to keep foot pedal in place. Provide several drops of oil to pivot points periodically to prevent binding. Lubricate the sliding components with a heavy-bodied chassis grease or wheel bearing grease. Keep all areas of the dolly clean, particularly the hydraulic ram and sliding frame components. 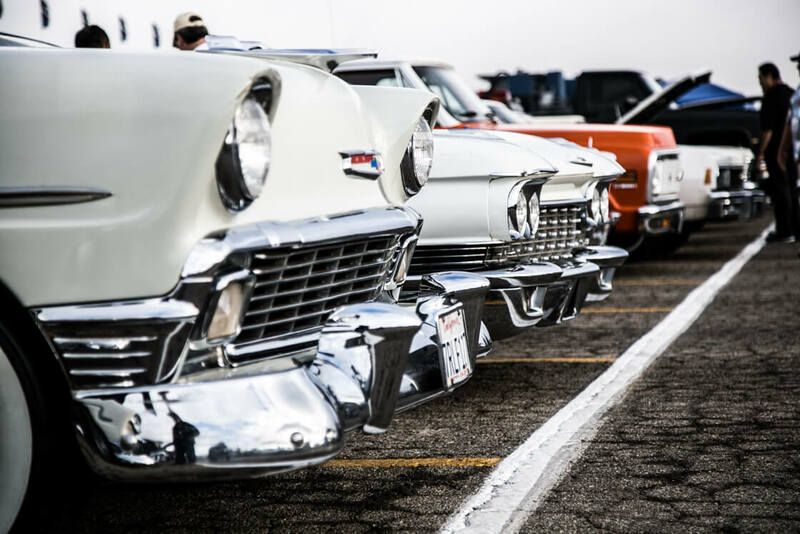 Before each use, check all hardware for tightness, all components for damage, hydraulic fluid leaks and rust or dirt on moving parts. Store in a clean and dry environment when not in use. Coast all machined surfaces with a light lubricant film of oil or suitable protestant to prevent rust formation.